I was having a very special friend over to share our Thanksgiving "left-overs" the day after Thanksgiving. A few days before she mentioned how she had enjoyed delicious Pumpkin Whoopie pies that had been made by a co-worker several years before. My search started. This is the first recipe I have ever made with pumpkin. Not only was it easy to make, it was delicious and my friend was thrilled. This is definitely a recipe I'll be adding to my holiday dessert file! Cut the parchment paper into 3 inch squares - 24 of them. Beat together the brown sugar, sugar, oil and pumpkin. Add eggs one at a time, mixing well. Add vanilla. Slowly incorporate the dry ingredients into the wet until just combined. Using a pastry bag with a round tip, or a zip lock bag with one corner snipped, squeeze out concentric circles of batter, starting from the middle and working outward until the circles are about two inches in diameter. The parchment squares allow you to move the square while keeping the bag in the same spot. Transfer the squares to a baking sheet and bake for 11 minutes, or until firm. Cool on a rack. Beat together the cream cheese and butter. Add the powdered sugar, vanilla and cinnamon. Frost the flat sides of the pies and top with another piece. Cooks tips: I found this whoopie pumpkin pie batter to be extremely thick. As the size of the eggs for the recipe were not specified I used large eggs. Next time I will use extra large eggs to make the batter a bit looser. 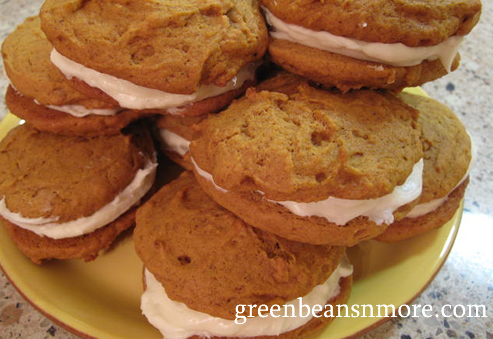 The filling recipe makes more than enough for all the Whoopie pies. My recipe made 14 pies.